JLL S400 5.5” LCD – Multiple speeds – multiple inclines High end VIEW PRICE HERE! JTX Slim Line 7 programs – Large digital display – Built in speakers High end VIEW PRICE HERE! XM-PROIII 12 programs – Built in speakers – Large running surface Mid range VIEW PRICE HERE! X-LITE I Super Lite design – 8 high & low programs – Lifetime motor warranty Affordable VIEW PRICE HERE! Home Garden Store LED display – Increased resistance – Emergency stop tag Affordable VIEW PRICE HERE! There are many motorised folding treadmills on the market these days so you are always spoilt for choice, however, there are some out there that claim to offer a great all round experience but simply do not. If you are looking to avoid those treadmills, have a look at the top 5 motorised folding treadmills on the market below. Easy to install – This treadmill is very easy to install and you can be up and running within the space of 20 minutes. 5” LCD Monitor – The large LCD screen provides users with all the stats such as distance travelled, time, speed, and heart rate. Multiple warranties – You can take advantage of the 5 year motor warranty along with the 2 years parts and labour. Multiple incline levels – If you find some of the challenges are getting easier you can simply adjust the incline level with up to 20 to choose from. This folding treadmill will mean you can transport it from room to room with ease and it can be stored out of the way after every use. Along with the many features, this JLL product is top of the range and has everything for beginners and experienced users. Flat folding – Many other folding treadmills fold up nicely but this one is able to fold into a flat appearance which makes it even easier to store away in smaller places. Multiple settings – You will be able to change between 15 levels of incline and run up to 14km/h which gives everybody a variety of challenges to choose from. Large digital display – The large digital display will ensure users are able to see certain statistics such as speed, distance, incline levels and time. 7 different programs – There are 7 different programs for users to choose from depending on the difficulty of challenge they seek. Built in speakers – The built in speakers will ensure users are able to listen to their favourite music whilst exercising. This JTX Slim Line product has everything from built in speakers to different speeds and levels of incline to suit its users – there isn’t a lot this treadmill doesn’t have so if you have the funds to purchase it, it shouldn’t definitely be considered as your next buy. Magnetic safety key – The magnetic safety key will ensure the machine shuts down if the key should come out of its slot, which will happen if the user falls off or falls to far behind. 12 auto programs – The 12 programs will ensure users can choose a challenge to suit their needs and along with the 3 manual levels of incline will make challenges even more difficult. Built in speakers – You can attach your iPod to this treadmill so you can listen to your favourite music and keep motivated during exercises. Large running surface – You will have a large running surface of 1100x400mm so you can be sure you will not run out of room during harder exercises at quicker speeds. The price tag this treadmill comes at is very competitive and there isn’t many other treadmills out there that can provide this much quality for its price. If you are looking for an affordable treadmill that has everything you need to get started and more, you should consider this XM-PROIII product. Warranty – A lifetime motor warranty will definitely give potential buyers peace of mind, along with the 2 year parts and frame warranty that goes with it. 8 High & Low programs – A variety of programs to choose from will ensure you never get bored and you are always presented with a challenge no matter how fit you get. Built in speakers – As with many of the latest treadmills come, this one also comes with built in speakers so you can listen to your favourite music during exercise. Super Lite design – The treadmill only weighs 23.5kg so you can be sure you will have an easy time folding this up and storing it away. This super lite treadmill is perfect for those that do not have enough space to keep a treadmill in the same place permanently. This one can be folded away with ease and it doesn’t take up hardly any space. This treadmill is very affordable and will suit any beginners down to the ground thanks to all the features it provides. LED Display – The LED display will provide its users with the important statistics such as distance and speed. 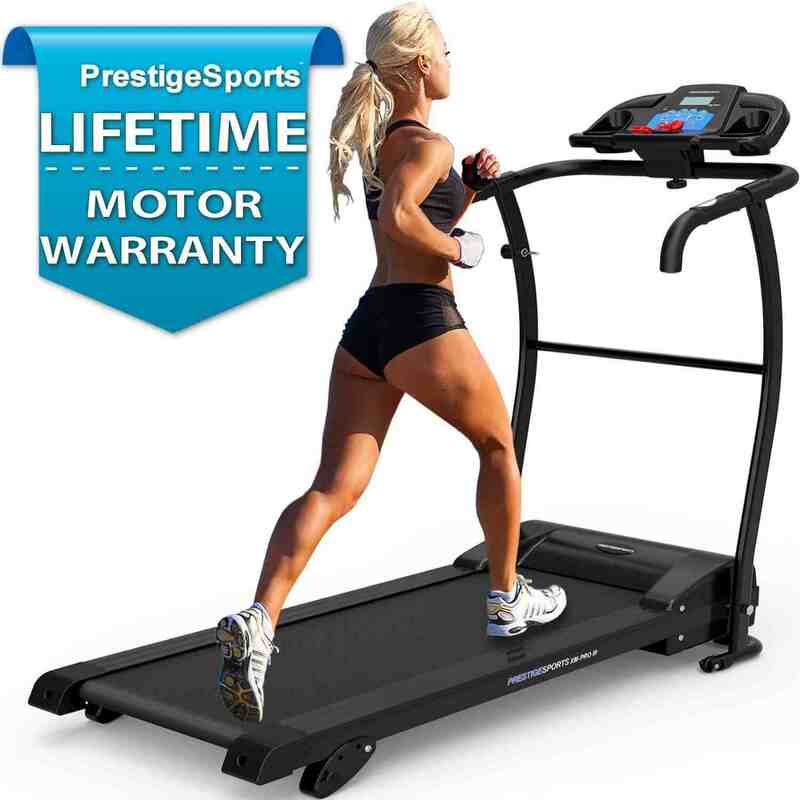 Increased resistance – This treadmill can be elevated with a slight adjustment to provide users with increased resistance and thus a tougher challenge. Emergency stop tag – The emergency stop tag implemented into this design will ensure the treadmill shuts down if the user should fall off. Heavy duty design – This treadmill is built with heavier people in mind and it can cater for anyone weighing up to 120kgs. With a large running surface that includes rubber suspensions users can be sure of a comfortable run without hurting their joints too much. This treadmill is perfect for those looking to lose a lot of weight at a slower pace. All in all this product is very affordable and comes with all the basic features a lot of the other treadmills in the same market do not. The above 5 folding treadmills are in this list for a reason and that’s because they are all built with space saving in mind along with the fact they still provide users with a good all round experience. The JLL S400 is a cracking treadmill for the price and includes many features and settings to better the running experience of its users – this is why it’s in top spot and should definitely be considered.